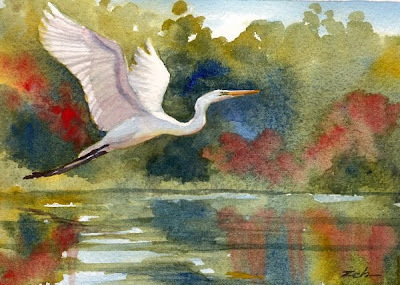 With a slow beat of its wings, a beautiful white egret lifts off from a pond. The colors of autumn are reflected in the water below. This painting has been sold, but if you like it, let me know. I can paint an original or make a print for you. See more of my bird art paintings and prints for sale in my Etsy shop. Have a great day!